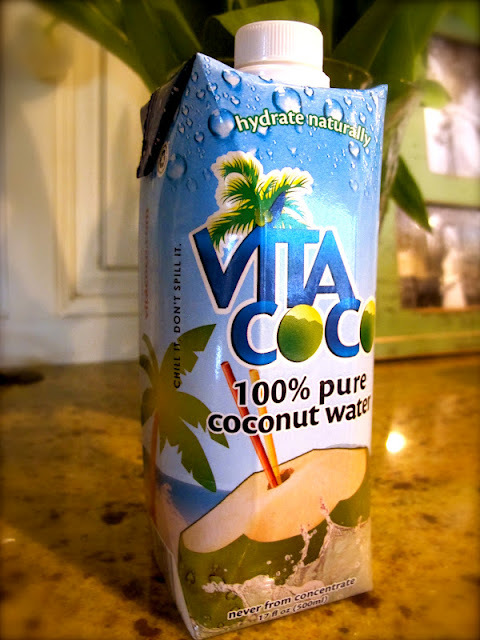 Loyal blog followers know about my love of coconut water...I fell in love with the stuff when I was an avid Bikram yogi before we left and the love affair resumed when we got down island and could get it straight from the source. For those of you who don't know - coconut water is one of the healthiest things you can put in your body. Not only is it totally natural, it is full of electrolytes, potassium and is actually more hydrating than water. While I personally love the taste - it should be said that the flavor is very unique and for many it is 'acquired'. It's doesn't taste like water and it doesn't taste like coconut milk - some actually liken it to slightly spoiled, watered down milk. Tempting right? While I think that's a little harsh, it's best to know what you are in for. Give it a try - if the taste doesn't win you over (it's not that bad, I promise) the health benefits should. We saw the "Vita Coco" you have pictured while at Costco the other day. Maybe your post is enough to prompt a purchase next time. All the best to you and Scott and your coming crew. Stay warm.